DuBOIS — Sydney Reffner’s high school softball career came to an end Wednesday afternoon after a game that did not reflect how good she’s been as an Everett Lady Warrior. But moments after making the final out and wrapping up an 0-for-4 day at the plate in Everett’s 6-2 loss to Karns City in the District 5-8-9 Class 3A subregional at Rose & Dennis Heindl Memorial Field, Reffner was hugging and encouraging teammates with a smile on her face. “We’re a family,” Reffner said. “When I came in as a freshman, I felt right at home. I didn’t feel like a little freshman. I always felt welcomed, and we just had a very successful four years. Reffner came into the game hitting .544 with 23 RBIs in 17 games but could not get the better of Karns City pitcher Logan Byers. Though it may have seemed like a strategic ploy by Karns City to work Reffner and her teammates inside, it was just the Lady Gremlins doing what they’re best at and letting it fly. Karns City was in control for most of the game, but it was actually Everett that scored first. Brooke Colledge beat out an infield single with two out in the first inning, stole second and scored on Alex Iseminger’s single. The Lady Gremlins, however, tied the game in the bottom of the inning with an unearned run, something that has become a theme for the Lady Warriors this season. While starting pitcher Jacie Martin had pitched her way to a stunning 0.92 ERA coming into Wednesday’s game, she had allowed 24 unearned runs. 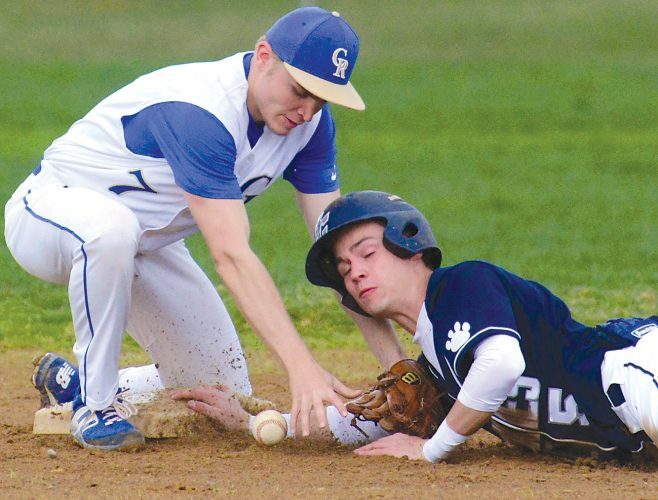 That continued in the subregional game when just two of Karns City’s six runs were earned. Reffner, Martin and Brittany Ewing are among the seniors who played in their final game for the Lady Warriors. Karns City’s McKenzie Dann came up with the biggest hit of the game, an RBI triple to right field which nearly bounced over the fence thanks to the artificial turf. If it had, Alyssa Stitt, who had reached on a fielder’s choice, would have had to go back to third and Dann to second. As it stood, Kate Allen grounded out three pitches later to bring home Dann and give Karns City a 3-1 lead. Karns City tacked on three more unearned runs in the bottom of the sixth inning to provide some insurance. The Lady Warriors scored a run in the seventh inning on back-to-back doubles by Katie Price and Martin, but Reffner flew out with the tying run on deck. Stitt was relieved to see his team close the game out, noting they’d allowed some big innings in earlier games. Despite losing some talented seniors, Colledge and Iseminger highlight a solid group of returnees for next year’s Everett squad. EVERETT (2): Reffner ss 400, B. Ewing 2b 301, Colledge cf 311, Iseminger c 301, Price 3b 311, Martin p 301, Schleinkofer rf 300, Grubb lf 300, K. Ewing 1b 300. Totals — 28-2-4. KARNS CITY (6): Byers p 100, Milochik cr 010, Stitt ss 410, Dann 3b 312, Allen 2b 300, Ekis 1b 302, Fetterman pr 010, Grazioli rf 310, Wolfe cf 312, Neff lf 100, Clark ph 100, Fritters dp 200, Shay ph 101, Huff c 000. Totals — 25-6-7. E–Price, K. Ewing, Reffner, Dann, Stitt, Ekis. 2B–Ewing, Price, Martin, Wolfe. 3B–Dann. SB–Iseminger, Colledge, Grazioli, Wolfe. CS–K. Ewing, Dann. RBI–Iseminger, Martin; Dann, Allen, Wolfe, Clark. EVERETT: Martin (L)–6 IP, 7H, 4K, 2BB, 6R, 2ER, 104 pitches. KARNS CITY: Byers (W)–7 IP, 4H, 4K, 0BB, 2R, 2ER, 116 pitches. Records: Everett (15-3); Karns City (16-2).